The Charger is made of an archery target on wheels that travels down a 30-foot track toward a suspecting student armed with inert bear spray who is awaiting his charge. The purpose of the charger is to teach people when and how to correctly use their bear spray. Bear spray is your best bet for stopping an aggressive bear without harm. The spray is made of capsicum, the type of plant responsible for spicy peppers, and it temporarily reduces a bear’s ability to breathe, see, and smell. Learning how to properly use bear spray protects not only the mountain biker, but also the bear. Bear spray can do lots of things, including reducing the number of grizzly bears killed in self-defense, reducing human injuries caused by bears, and helping promote the recovery and survival of the grizzly bear. A 2008 study documented in the Journal of Wildlife Management demonstrated that bear spray stopped brown bears 92 percent of the time, and 98 percent of the people involved were uninjured. 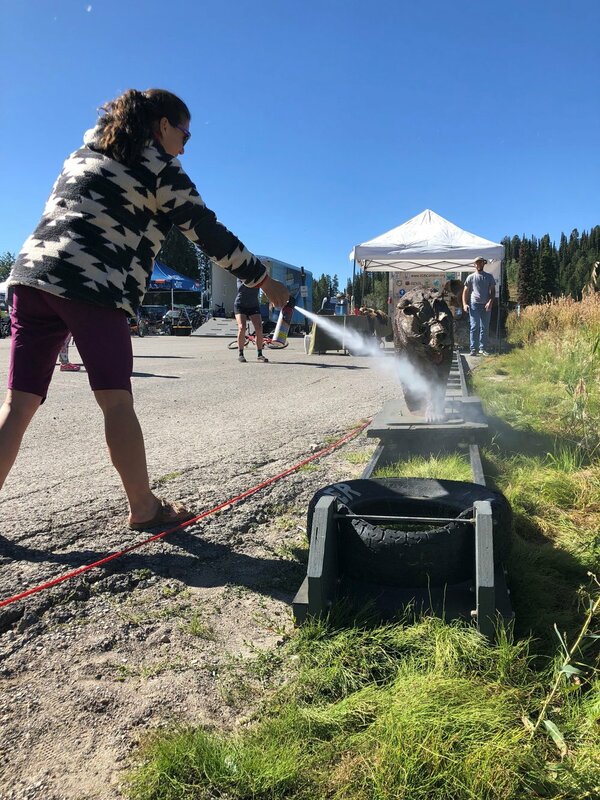 A big thank you to Teton Valley Trails and Pathways and Grand Targhee Resort for hosting us, and a big thank you to all of those who participated –- we had a blast! To learn more about bear spray and how you can use it to protect yourself and the bears of the Greater Yellowstone Ecosystem, please give me a call and/or visit the National Park Service’s website.